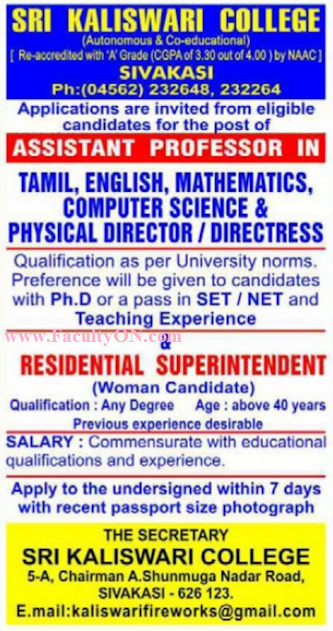 Sri Kaliswari College, Sivakasi has advertised in Dinamalar newspaper for recruitment of Assistant Professor/Residential Superintendent jobs vacancies. Interested and eligible job aspirants are requested to apply within 7 days.Check out further more details below. About College: Sri Kaliswari Trust, comprising a team of munificent philanthropists endowed with wisdom and foresight, embarked on launching an ideal College of Arts and Science in 2000 A.D. To impart value-based higher education to the student community and to mold them to be fit for the next millennium. The Government of Tamilnadu in its G.O. 190 dated 7th June 2000 graciously granted its approval for starting the college in the academic year 2000-2001. Preference will be given to candidates with Ph.D or a pass in SET/NET and Teaching Experience. Commensurate with educational qualifications and experience. How to Apply: Apply to the undersigned within 7 days with passport size photograph.